Seal the Deal demystifies how successful coaches make money while making a difference. This innovative, 10-step system teaches coaches, consultants, and solopreneurs how to integrate the "critical trinity" of networking, marketing and sales with a coaching approach to get more ideal clients. The author, Suzi Pomerantz, MT., MCC., is a Master Certified Coach who has been coaching executives for 13 years in over 110 organizations worldwide, including 7 companies on the Fortune 100 list, 6 corporate law departments, and 11 law firms. "Seal the Deal, more than a traditional book, is a series of powerful coaching sessions dealing with a big breakdown that many excellent coaches and consultants face today: they don't know how to sell their services to organizations. 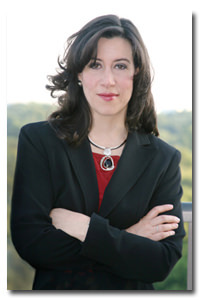 Suzi Pomerantz not only knows, she can also coach us so we can learn that critical ability." "I've experienced the system personally and can say that the "Seal The Deal Formula" belongs in any professional's chemistry kit." Packed with worksheets and templates, personal action plans and homework action steps, Seal the Deal is the consultant's guide to business development clarity. 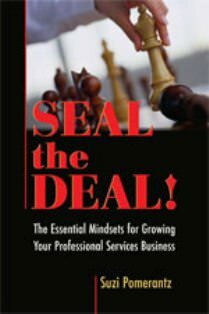 What you fear about sealing the deal is usually stuff you're already good at, and Seal the Deal encourages you to be yourself and sell more services! If you've ever thought that you shouldn't have to sell, and that your clients should just find you because you're good at what you do, then this book is for you. Get Your Free Quiz and find out your Seal the Deal Score! You'll also get a bonus Subscription to "Excellence, Impact, Legacy", our monthly newsletter filled with practical tips about networking, marketing, sales and leadership resources to make your work and rainmaking easy! Your contact information is safe with us and we will protect your privacy. We will never rent or sell your information and you are always free to opt out of any future contact from us at any time. and subscribes to its principals and practices. Send mail to webmaster@innovativeleader.com with questions or comments about this web site.